Real Time Gaming has done it again with Fair Go Casino, an Aussie-friendly casino that caters to all players and Aussies in particular. And what better way to introduce you to Fair Go than a no-deposit bonus code for free cash! Check it out below. 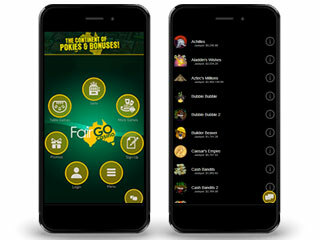 In this Fair Go Casino Review, we set out to show why Aussies and everyone else love gaming here. Fair Go is regulated in Curacao. Its games are all run by a random Number Generator (RNG). So, there are no hot games or cold games. There are however over 150 spectacular games from Real Time Gaming! 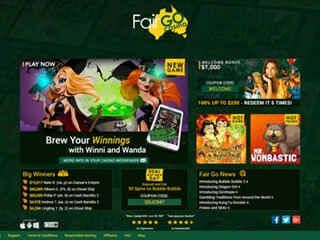 You’ll see as you read this Fair Go Casino Review, there is a fountain of gaming entertainment to be had at Fair Go. Fair Go also runs an informative blog where they breathlessly introduce new games to the serious article on the top traits of successful gamers. It might surprise you to read that successful gamers have a great deal of self-confidence. It isn’t just luck that creates winners! The casino has many promotions primarily for high-percentage bonuses and numerous free spins. As we said, Real Time Gaming (RTG) provides all the games at Fair Go. Just go to their home page and see the colourful graphics that dominate the page. Even before you avail yourself of the games, bonuses, service, and everything else you can enjoy at Fair Go, you see that this is a casino that above all wants players to have fun, to put a smile on their face. Fair Go has over 150 great RTG games. Given that Fair Go is a top Aussie casino, we’ll use Aussie-friendly language throughout our Fair Go Casino Review! 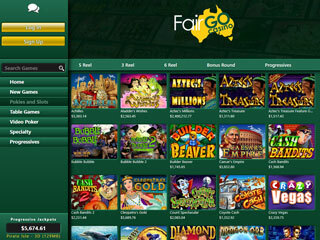 Thus, pokies (slots) dominate game selection at Fair Go; there are close to 100 pokies. Pokies have come a long way from the rather sedate three reel and fruit pokies of a different era to the lively five reel video pokies that make up the bulk of all pokies now available online. Fair Go goes this one better, having a selection of six reel pokies. The excitement players regularly have on five reels is simply enhanced when they play with six reels. In addition to their big collection of fun and exciting RTG pokies, the casino has a large selection of table games. As important as graphics and animation are to making pokies so different one from the other and maintaining a high level of entertainment value, the graphics in table games are, perhaps, even more important. This is because table games for so long defied the efforts of game developers to recreate the live casino feel. RTG has mastered the art of table game graphics; each of the many top table games at Fair Go is beautiful in its own right and a joy to play. Three pokies have progressive jackpots. Aztec’s Millions usually exceeds one million AUD whilst the others always seem to reach high six figures. If you love both progressive jackpots and extraordinary graphics, then Megasaur is the pokie for you! Check out those teeth! The casino also has three poker progressive games for those who like to go for all the gusto in table games. Fair Go has more than 50 different variations of video poker. The payout rate in video poker often reaches or exceeds 99% so it pays to learn as much as you can about this form of poker. In fact, because video poker is a single player game, meaning only the player makes any decisions, strategy is relatively straightforward. You can also play with a strategy card. So, if you love to win above else, video poker may be the perfect game for you! Video poker lends itself perfectly to you playing multiple hands at the same time. You can go from one hand all the way up to 52 hands. The casino goes all out for you by offering fantastic bonuses. It begins with the superb welcome offer. But it never stops! Every month there’s a new bonus offer. Sometimes, the monthly promotion is a series of bonus offers on consecutive days. There’s no better way to grow your bankroll, other than winning (! ), than by taking full advantage of the many bonus code offers. The casino also sponsors a “Game of the Month” where bonuses and comp points are multiplied by playing that game. So a word on comp points is in order here. Every time you place a bet, the casino turns the amount of the bet in points. These points eventually grow to great height. You can redeem them for casino credits and play on. You can receive extra bonuses on Mondays, Fridays, and weekends. The casino runs a cash back promotion where you can qualify to receive an extra 25% of any deposit. The casino has many banking options including in Bitcoin the virtual currency that some say will one day replace national currencies. Be that as it may, many players prefer banking in Bitcoin. Many casinos accept deposits in Bitcoins but not withdrawals. Fair Go allows Bitcoin withdrawal also. Every money transfer is protected by SSL encryption technology. This is such an important point because the casino acts as a virtual bank when your money is on account there. The casino follows your money all the way from your bank to the casino and from the casino back to your bank. Ask and Fair Go shall answer. The pros at customer service are ready to assist in any way they can on a 24/7/365 basis. They stand ready via chat, toll-free telephone, and email. The latter contact method is usually answered in a matter of minutes. Here is a casino with a world-wide reach whilst simultaneously emphasizing all things Aussie. If this Fair Go Casino Review has been successful, you’ll start your walkabout through Fair Go right now!